I have one more page journal page for Art Journal Journey this week. The theme this month is maps, hosted by Mary. I am also going to link up to Paint Party Friday. Thank you once again Kristen and Eva for this great site. So today's page was a Gelli print in my stash pile, and when I looked at it and saw the dots I thought of giraffes. I painted some a few weeks back, and I was ready to paint a couple more. This African map and the beautiful woman is from a very old 1950's atlas I have that I have been cutting up for awhile now. Its interesting to see how much the countries that make up this continent have changed in all the years that have passed. Its a different world now for sure. This week has been really busy for me and I am looking forward to a relaxing weekend. How about you, any big plans? and don't forget to stop by both sites to see some awesome art!!! An AMAZING page... so beautiful made ! I am thrilled about that fabulous collage Erika! All goes together perfect.Love your giraffes! Happy relaxing weekend to you ... I wish the same to me.. we have a big fleamarket in our little town for the sake of variety - so I will see if the weekend brings a bit fun to me. Imaginative map art. The sentiment is so true. Yes, Erika, I've wondered also how different just Afrika has been. Dramatic page and wonderful 50's ephemera. Enjoy the weekend and we'll be seeing each other before you know it. Do you have the name of the "box" guy anywhere????? Your gelli print background is great and goes so well with the map and the lovely giraffes and other images. Love your print. Very well done. Hey there, hope you are doing great. Thanks for stopping by my blog. Have a wonderful weekend and I love that calendar of events you have on your previous post. Great job! Wonderful African page you created Erika. 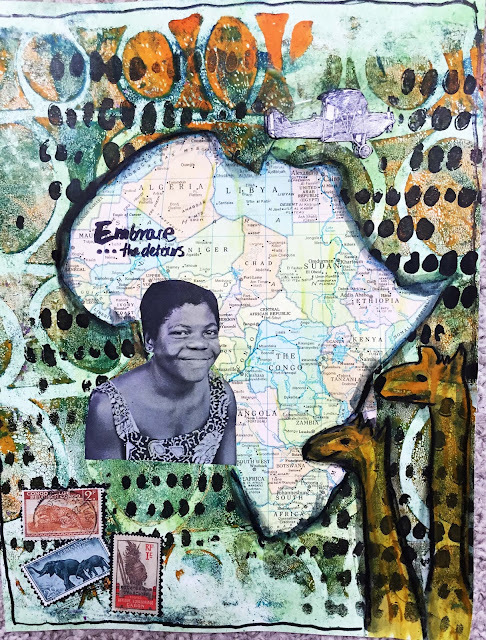 Some of my fav things: maps, gelli prints, giraffes, far off places, postage stamps and more! What a fabulous page!! Love all the colors and imagery along with the sweet giraffes. Happy PPF and happy weekend! Love how the giraffes are looking at the map. its a fantastic page. Great page...so interesting to see the old maps... wonderful job...love the stamps and photo too!! Blogger is playing tricks on me again, because your posts are NOT showing up in a timely manner on my sidebar. It took nearly a day for this one to appear. I might be able to embrace the detour, but I'm not sure I can embrace all the changes that have occurred over the past few years in Africa. One thing I'm happy about is Apartheid is gone in South Africa, but Ebola in West Africa, and the vicious attacks by Boko Haram extremists in both Niger and Nigeria are nearly as bad as ISIS. Sorry for the tirade. Seems I do that when I leave you a comment (grin). I DO love your wonderful page with the giraffes and map, though! And those postage stamps are incredible! Ahh, I love this. I grew up in Africa. I have been to some of the places in your map. Loved the visits. Love the colors of this page and the wonderful repetition of the dots! Such a beautiful page!